There are many things around us which we see everyday. However many of the times, you don't think why such things are made in a particular way. 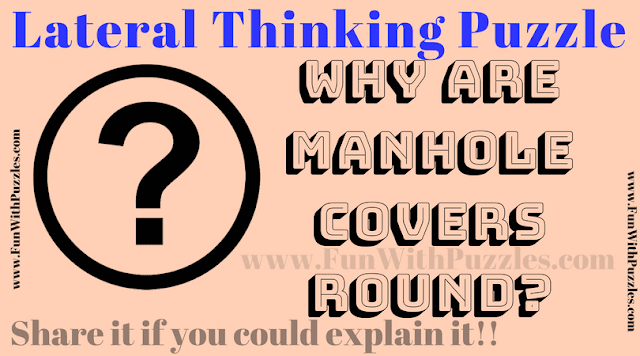 Here is the lateral thinking question on manhole which many of us see it almost on every day basis. But have you every wondered, why are the manhole covers round? Think about it and post your answers in the comment section of this post? Can you answer this lateral thinking question? Answer of this "Lateral Thinking Question", can be viewed by clicking on button. Please do give your best try before looking at the answer. If we put a square cover on a manhole, then at the wrong angle it will immediately fall down. This won’t happen with a round cover. Is it because the when we use other shapes like rectangles or squares, they can rotate about diagonals and fall down? Yes, you are right. Diagonal will bigger than side for a square or rectangular shape and these can fall down along the diagonals if rotated.